"A rich chocolate mousse is prepared with high quality chocolate and fresh eggs. Two thirds of the mousse is baked, and the rest is used as topping. Please note: this recipe contains raw eggs. We recommend that pregnant women, young children, the elderly and the infirm do not consume raw eggs. Important: be sure to use only fresh eggs for this recipe." In a large bowl, beat egg yolks and 1/4 cup sugar until thick and lemon-colored. Fold into chocolate mixture; set aside. In a large glass or metal mixing bowl, beat egg whites until foamy. Gradually add 1/8 cup sugar, continuing to beat until stiff peaks form. Fold 1/3 of the whites into the chocolate mixture, then quickly fold in remaining whites until no streaks remain. Pour 2/3 of mixture into prepared pan. Bake in the preheated oven for 40 minutes, or until filling is just firm in the center. Allow to cool, then remove from pan and refrigerate 1 hour. In a medium bowl, whip cream to soft peaks and fold into remaining chocolate mixture. Cover and refrigerate. 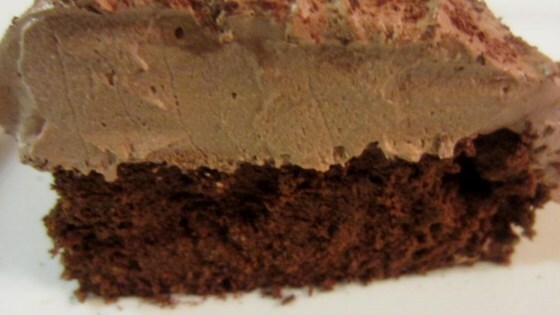 Spread remaining mousse over cooled cake and dust with cocoa. Too much chocolate is just enough with this moist, prize-winning cake. This recipe is not worth the trouble. The cake is dense and bitter. I did not care for this recipe. if you try it bake for 20 minutes not 40. Made this for my husband's birthday. Light and fluffy. So tasty and I'm not usually a whip cream fan. Not overly sweet and surprisingly light for a no-flour cake!